Hillsboro senior Josh Keets attempts a layup in the first half Friday at Hillsboro High School where the Indians took on the Washington Blue Lions. Hillsboro’s Mason Swayne finishes the fastbreak with a layup Friday at Hillsboro High School where the Indians battled the Blue Lions in FAC play. 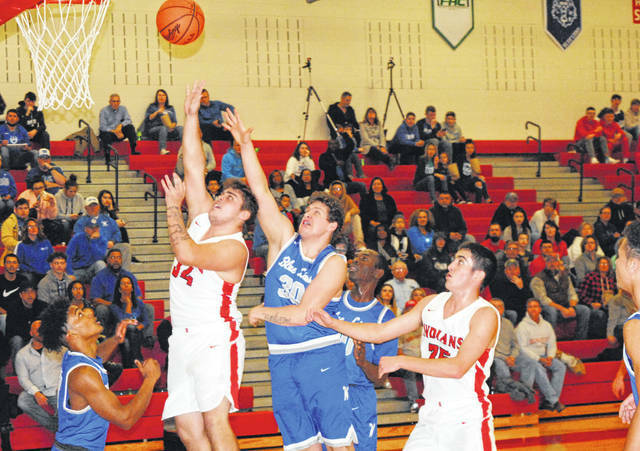 The Hillsboro Indians hosted the Washington Blue Lions on Friday at Hillsboro High School in a matchup of Frontier Athletic Conference boys basketball teams and lost by a final score of 67-53. 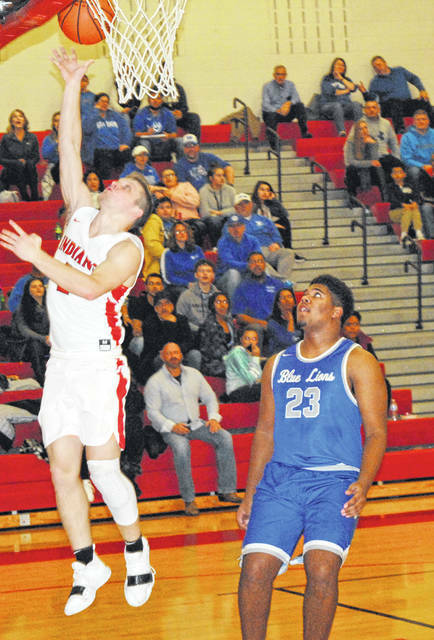 The Indians Mason Swayne and Ethan Watson combined to score seven points in the period as Hillsboro tried to keep the Blue Lions within reach. After half-time Washington came out on a mission and quickly pushed their lead to double digits less than two minutes into the third quarter with the scoreboard reading 37-27. Blaise Tayese and Steward each scored six points in the quarter for the blue lions and Evan Upthegrove added four of his own as Washington doubled their half-time lead to 14 points at 49-35 as the third quarter came to a close. In the fourth quarter Washington was able to add to its already significant lead as steward, Tayese and upthegrove kept the pressure on the Indians and secured the 67-50 victory. “I don’t know how to coach non-agressive defense. We want to get in you, we want to make you uncomfortable and when we can we want to jump in passing lanes and get in transition because you’ve seen our athletes; I want to be in transition,” Scott said. Washington will take on the Chillicothe Cavaliers Tuesday, December 12, at home while Hillsboro will take on the Lynchburg-Clay Mustangs at home on Saturday, December 8.